Every so often, I reinstall my computers. 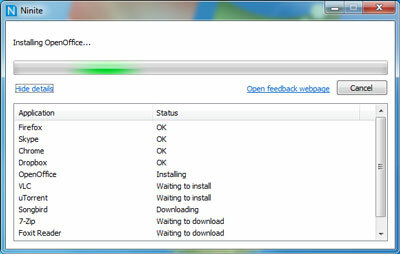 One of the biggest hassles of this, is installing all the software I use. I recently discovered a simpler way to do so; Ninite. You simply go to the website, check the boxes for what software you need, then download the installer. Having downloaded the installer, you start it, then leave it to its business. It automatically downloads and installs all the software you have specified. That’s it. You’re done! The list of software isn’t terribly long yet, but they are adding new software all the time.